In Japanese language ‘O’ is a magic prefix. If you put ‘O’ to words (not only nouns but also verbs and adjectives) you can add the meaning of ‘importance’ or ‘respect’ to the words. So, Osechi is ‘o-sechi’ and it simply is ‘Sechi’, which means ‘joint’. 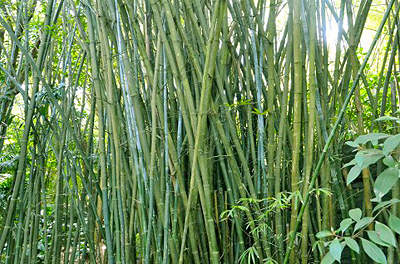 It may help you to imagine the concept of the word ‘sechi’ if you see a photo of bamboo trees. A bamboo tree is a metaphor of life and joints are significant moments in lives. There are five seasonal festivals in a year. It can signify the moment of season changes but there is an interesting concept behind. These festivals are held on a double odd numbers days; 1st January, 3rd March, 5th May, 7th July and 9th September. This is an influence of a Chinese philosophy which odd numbers were thought to be sacred. 1st January is the most important event in the year because we, the Japanese, traditionally add one year to age on the beginning of the year but not on birthday. This is because we have been spending more than 10 months in our mothers’ womb before our birth. 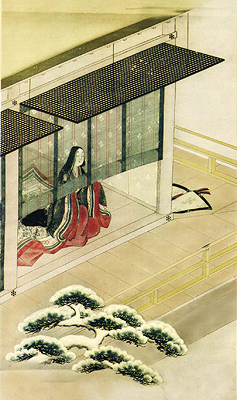 Noble lady in New Year, probably in the Imperial Court of Heian period. East Asian age reckoningW is a concept and practice which originated in China. Newborns start at one year old, and each passing of a Lunar New Year, rather than the birthday, add one year to the person’s age. The first year of life is counted as one instead of zero. The traditional system of age reckoning, or ‘kazoe’, was rendered obsolete by the law in 1902, when Japan officially adopted the Western system, known in Japanese as ‘man’. However, the traditional system was still commonly used, so in 1950 another law was established to encourage people to use the Western system. Today the traditional system is mainly used by the elderly. Elsewhere its use is limited to traditional ceremonies, divinations, and obituaries. Back to the topic, in the Imperial Court in KyotoW, big parties with special dishes were served on these ‘sechi’. The culture of the special imperial dishes for 1st January is thought to have begun in Nara period and became common among bushis (samuraiWs) in Edo periodW. 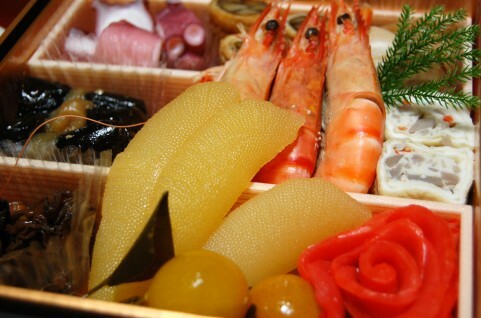 ‘O-sechi’ known today is packed in lacquered multistoried boxes. This tradition is said to have started in Meiji period with the influence of the cuisine culture in ‘Chaya’ (Tea houseW). The tradition became more familiar after the Second Word War when department stores started to sell in such style. 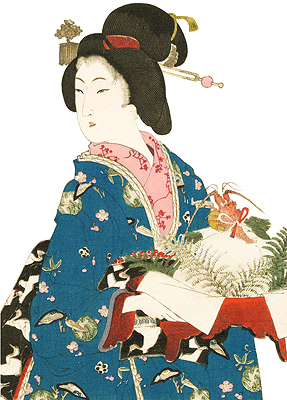 A lady from rich family holding ‘Kagami mochi’, piled round-shaped ricecakes with Japanese spiny lobster, bitter orange and white-backed fern on red lacquered stand in Edo period. O-Shogatsu (Japanese New YearW) is a day when we welcome ToshigamiW, deities of the year in Shinto religion. We pray to Toshigami for rich harvest and health of family members in the year. 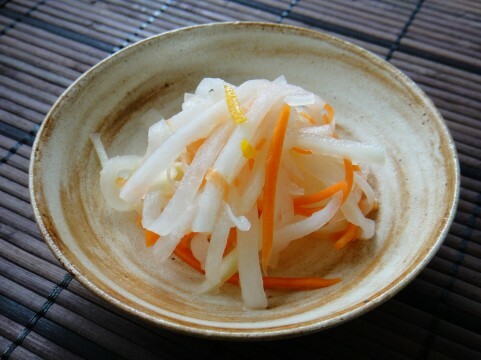 ‘O-sechi’ was cooked for Toshigami and served on the last day of the year and on the following day, 1st January, people ate it as an offering removed from the altar. Toshigami stays at people’s house from 1st January to 3rd January. Entering into kitchen within these three days was forbidden because ‘Kamado gami (Kitchen godW) would get upset. There was even a belief that there would be fire occurring if breaking this taboo. ‘O-zoni’ (ZoniW), soup dish with sticky rice and vegetable, was the only dish allowed to cook in these three days. For such reason, people cooked plenty of dishes for three days in each house at the end of the year. Another reason is said to be freeing housewives from kitchen works. 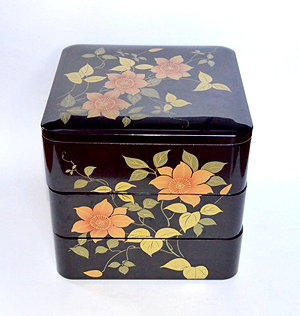 3-tier lacquered box. A typical piled boxes for Osechi dishes. The nest of boxes with various traditional New Year dishes is usually in 4 or 5 tiered. Originally, the tiers are 4 but depending on the area, 5 tiers are also thought to be the proper. Still, there are more nuclear families than large families, 3 tiers’ Osechi boxes are becoming more common. There is a rule for what to put in each tier. 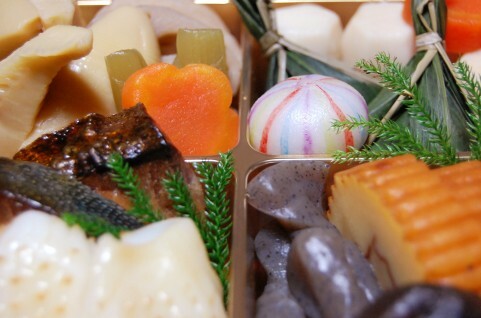 Inside the box filled with New Year ‘Osechi’ dishes. ‘Gomame’, wrapped and decorated inside the box. 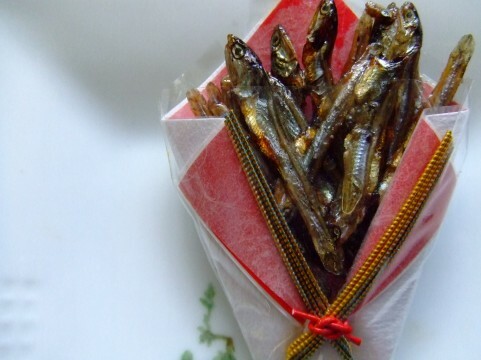 Dried young sardines cooked in sugar and soy sauce (GOMAME, TAZUKURI), etc. Grilled Japanese amberjack (BURI), etc. 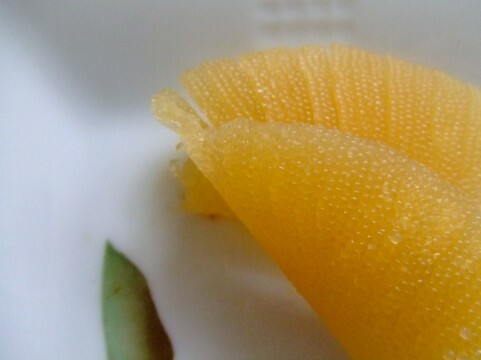 Various ‘Nimono’ in 3rd tier. Colocasia esculentaW cooked in sugar, soy sauce and sake (YATSUGASHIRA, or SATOIMO), etc. Pickled lotus roots (SUBASU), etc. Each dishes have special meaning to invite happiness, luck and wishes for perpetuation of family descendants. You can look at some of the meanings written in Wikipedia, OsechiW.